National U-18 Female Volleyball Team returns home proud. 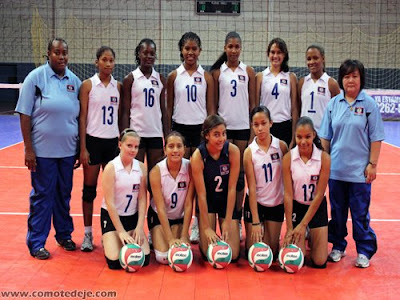 The U-18 national female volleyball team returned today from participating in the Central American Youth Volleyball Championship held in Tegucigalpa, Honduras. This is the first time Belize is participating at this age level. The team was comprised of Krystal Bevans (Captain), Kaitlyn Woods (Libero), Sherika Burton, Emily Evans, Kadijah Broaster, Hanna Diskin, Nayala Tun, Leandra Betson, Xiomara Quan, Karina Bernard, Alexandra Smith, Jahshema Saunders, Lupita Quan – Head Coach, Sherlene Johnson – Asst. Coach, and Nelita Bradley – Head of Delegation. The team returns proud of its performance showing. It took a set from the eventual champions Costa Rica (the favored team) and more importantly won the match against Nicaragua in 5 sets, 25-19, 19-25, 25-22, 22-25, 15-12. Sherika Burton put down a whopping 38 points in that match alone. For the Tournament, Costa Rica took gold, Guatemala a close silver, and Honduras bronze. Sherika Burton was superb at the tournament scoring 101 points in 5 matches and winning the BEST SCORER award for the tournament. The team received many praises and compliments in the improvement in the female volleyball program. The Belize Volleyball Association is proud of the performance by these young ladies and the coaches who have put in tremendous time and effort into training. It marks improvement in the program and we look forward to future success. Congratulations Team Belize.